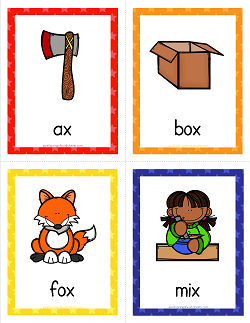 Please go to this page to see the coordinating things that begin with a-z worksheets or this page to see more alphabet worksheets. 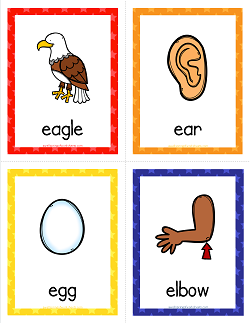 Things that begin with letter e are eagle, ear, egg, elbow, elephant, elf, envelope & eraser - & those are the words on these cards! Great for beginning sounds. Want to learn some words that start with letter f? 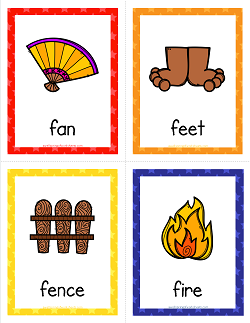 Here you go - eight bright colorful cards with the words fan, feet, fence, fire, fish, flower, football, & fork. Time to learn some words that start with g! Here's some awesome cards to do just that. 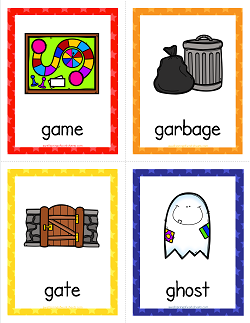 They have the words game, garbage, gate, ghost, gift, girl, guitar & gumballs. Heaven help us! We've got to teach words starting with h. Heaven has heard! 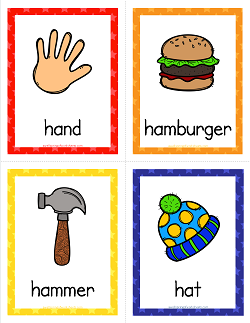 Here are h cards: hand, hamburger, hammer, hat, heart, hive, hook & house. 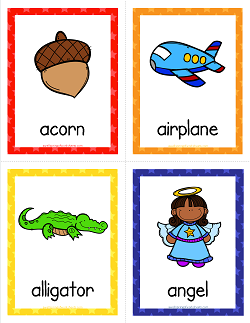 Here's some words that begin with i in handy to use cards. 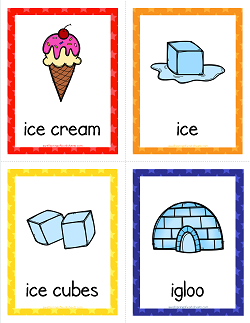 They include the words ice cream, ice, ice cubes, igloo, iguana, ill, ink, & iron. Have fun! Have a hard time thinking of things starting with the letter j? 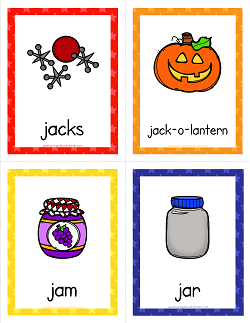 Here's some good ones: jacks, jack-o-lantern, jam, jar, jeans, jelly beans, jelly fish, & juice. Kinda in need of some words starting with a k? Well, here you go! 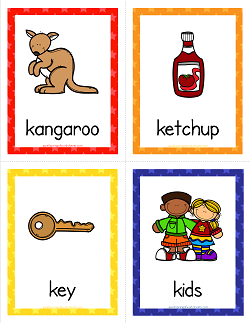 Some bright & happy cards with kangaroo, ketchup, key, kids, king, kite, kitten & koala. 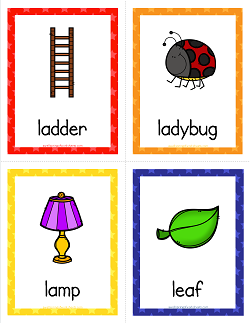 Letter l is so lovely...and here's some words that begin with l cards for your letter of the week: ladder, ladybug, lamp, leaf, lemon, lion, lock, and log. These words that start with letter m cards are just so special! They're calling to you..come see the words milk, mitten, monkey, moon, mop, mouse, mug & mushroom. Can you name some words starting with the letter n? Need a little help? 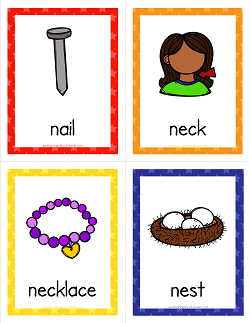 These cards are for you: nail, neck, necklace, nest, net, nose, nurse, and nuts. O thank goodness! Some really cute things starting with o cards! 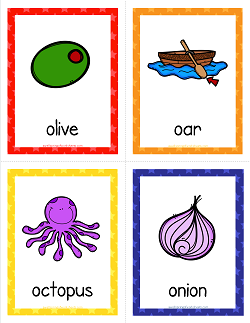 They have the words olive, oar, octopus, onion, orange, ostrich, otter and owl. 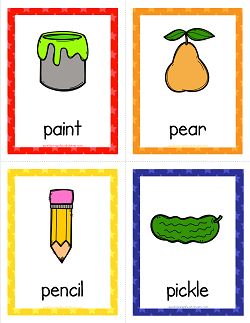 Here's some things starting with the letter p: paint, pear, pencil, pickle, pig, pizza, pumpkin, & puzzle. 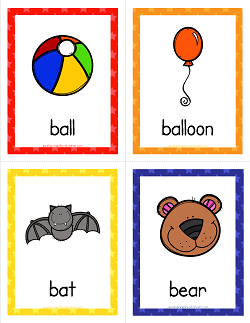 You can practice your p sounds with these cool cards! 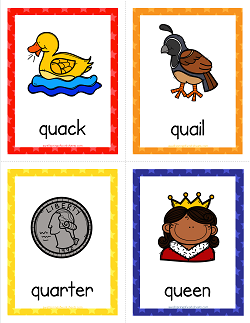 The most common things that begin with q are right here on these quaint & colorful cards: quack, quail, quarter, queen, question mark, quill, quilt, & quiz. O happy day! You just found some awesome words beginning with r cards. 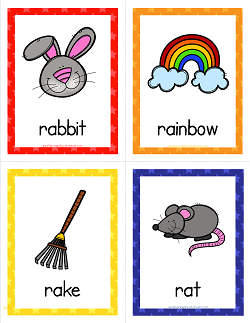 Great for beginning sounds: rabbit, rainbow, rake, rat, ring, robot, rocket, and rose. 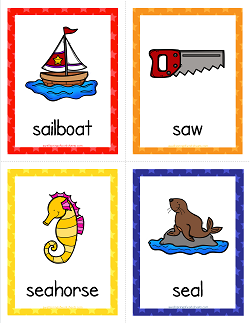 The words starting with the letter s on these cute cards are sailboat, saw, seahorse, seal, soap, sock, sun, & sunflower. 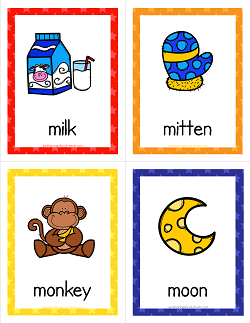 Great to use for beginning letter sounds! What a terrific treasure you've turned up! 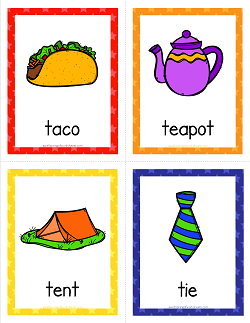 All these words beginning with t: taco, teapot, tent, tie, tomato, tooth, top, & turtle. Cute cards! Great fun! 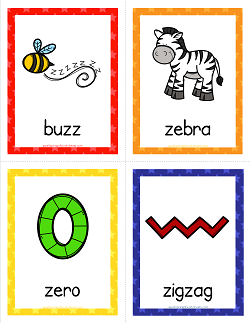 Use these things that begin with the letter u cards to practice beginning sounds. The words are: umbrella, umpire, under, underwear, unicorn, unicycle, uniform, and upstairs. 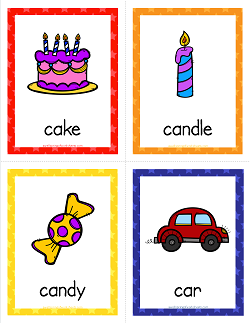 You'll find 8 words stating with v on these happy, welcoming cards. 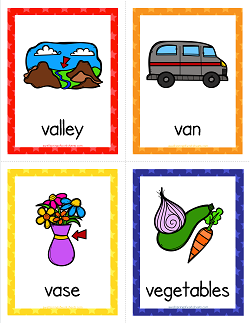 The words are valley, van, vase, vegetables, vest, vine, violin & volcano. Have fun! You've just found yourself 8 wonderful things beginning with the letter w! 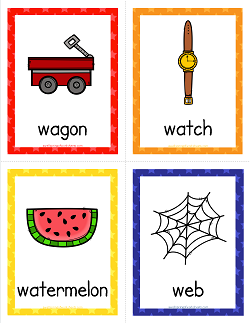 They are wagon, watch, watermelon, web, whale, wheel, window, & worm. Great way to practice the /w/ sound. Words that start with x are few and far between. These cheerful cards also offer words that have an x in them. They are ax, box, fox, mix, six, x-ray fish, x-ray &, and xylophone. 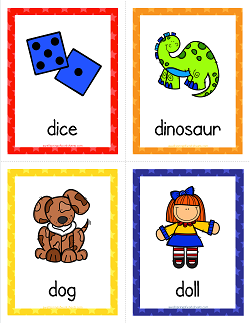 Bright and colorful, these words that begin with y cards can be used to teach kids about the variety of things that begin with y. 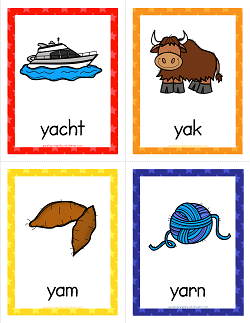 Enjoy the words yacht, yak, yam, yarn, yellow, yo-yo, yogurt, and yolk. Gosh, geezzz. Where can I find words that start with z? Right here, my dear, with the words buzz, zebra, zero, zigzag, zinnia, zipper, zoo, and zucchini.